The next book in the number-one internationally bestselling franchise. In this follow-up to The Book of Awesome, Neil Pasricha looks at even more of the little things that make us smile every day. Because couldn't we all use a little more AWESOME? I cannot get my hands on this book fast enough. 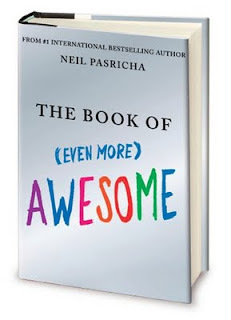 You all probably remember that I recently reviewed The Book of Awesome, the prequel to The Book of (Even More) Awesome, which is based on Neil Pasricha's blog 1,000 Awesome Things. The Book of Awesome was the ultimate feel good read for me, and one that is destined to spend a good, long time on my favorites shelf. How could I not want more awesome? If I haven't convinced you to check this one out, check out the trailer below.